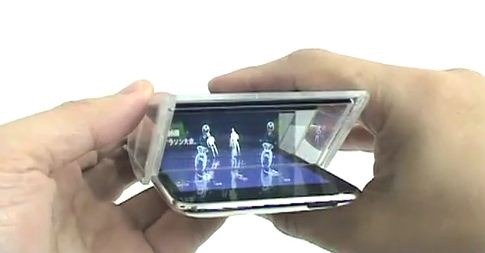 A Japanese media artist Jitsuro Mase has come up with this amazing accessory for iPhone and iPod touch which allows you to watch movies in 3D without having to wear any of those funky-looking 3D glasses. His invention called the i3DG Palm Top Theater, strategically places a set of 3 half-silvered mirrors at a 45-degree angle on top of the iPhone using a concept known as Peppers’ Ghost. This creates a 3D image when looking down across the iPhone screen but best of all does not require any 3D glasses. Described as a simple analogue extension to view 3D videos, animations and accelerometer-based games, this simple add-on could allow for a whole new host of ideas and games. If enough developers are intrigued by this concept, they could potentially start creating content in thirds. Having already gained attention at the Ars Electronica Festival, it is now scheduled to appear at the 2012 Rotterdam International Film Festival. Problems with this technology are that it requires every video to be split up into the three components and since each layer is less than a third of a portion of the display, the viewing area is tiny with low resolution.